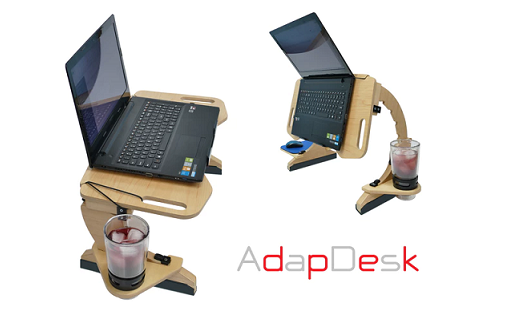 AdapDesk portable desk is specially designed keeping day to day use of laptops and other devices. Now you can comfortably use your laptop, devices on a bed, couch, floor and most of any places. You know how dangerous is to use the laptop on lap, they say its enormous heat can cause serious damage to your reproductive system and other organs. This simply ergonomically designed desk will help you get further productivity and long hours of entertainment or work with minimum back pain. There are many similar products out there, but AdapDesk is truly complete design with keeping costs in mind. These desks come in 4 editions with some or other changes in design. It includes fully foldable and standard editions. Its features include AdapDesk unit, AdapDesk Mouse Pad, Cup holder, High-quality furniture grade calibrated maple plywood with a hardened tough finish and scratch resistant work surface. Currently AdapDesk is available on kickstarter with lot of Backer Rewards to boost sales. So why waiting for the whole new experience of working on bed or couch? Try AdapDesk today and see how it changes your day to day life.